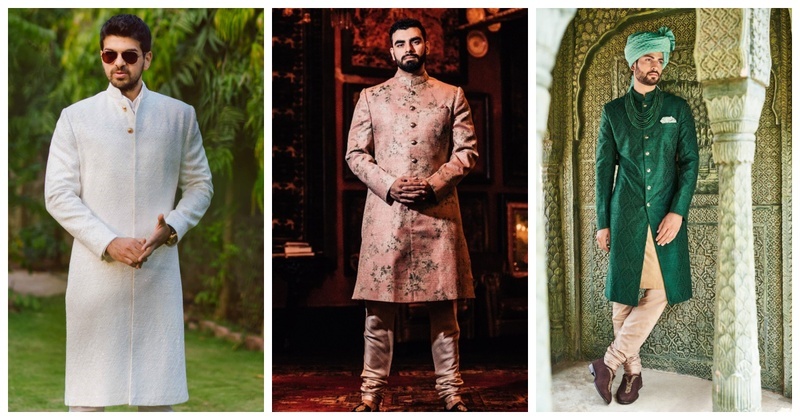 Trending sherwani colours for grooms which are NOT Gold & Red! Wedding season is going to kick in soon and I am sure all you grooms-to-be haven’t shopped yet! Instead of leaving this job on your mom / wifey-to-be, take it up yourself. And while we are on that topic, how about you select a hattke colour this time? Ditch the golden and red, man! Trust me, every woman appreciates when her man wears the colour pink. Pink is not meant only for Wednesdays! You’ll be a fresh air of breath at your wedding if you don a minty blue sherwani! Lime green or light green is a great colour for a daytime, spring wedding. Ouu! No one ever thought about bringing purple in the forefront, right? Lets tweak the game a little then! Rich and royal= two words that emerald green will make you feel like! Another hit dark shade is royal or peacock blue. It looks good with or without golden embroidery. Neither mango, nor lime, but mellow yellow makes a great shade for any event. Make sure you consult your biwi-to-be before you step out and buy one! It’s very important to match with your bride! You don’t want to clash with her just before you start your married life, do you?